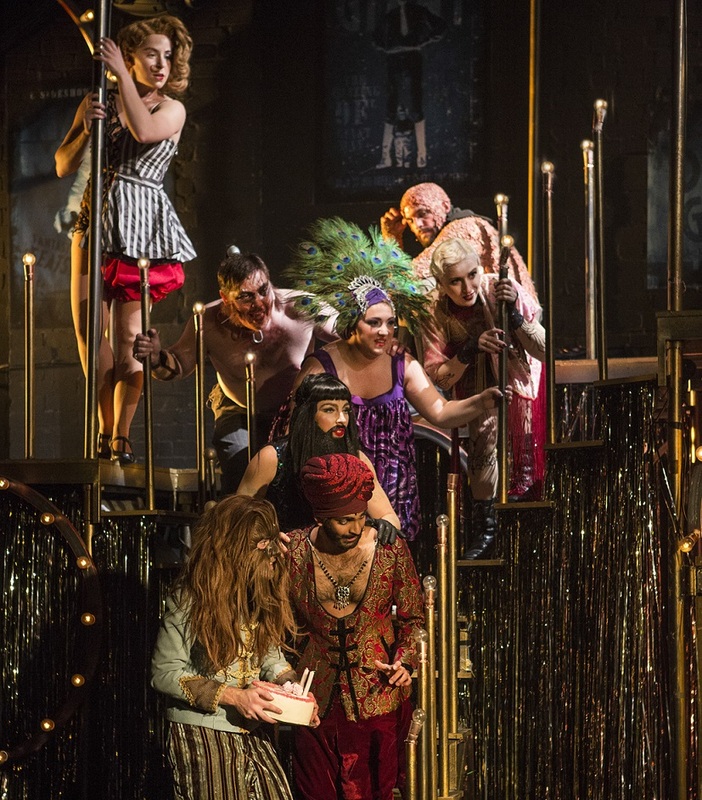 Side Show – a story of freaks and oddities from the world of 1920s and ’30s American carnivals – has finally premiered in London after two short runs on Broadway. 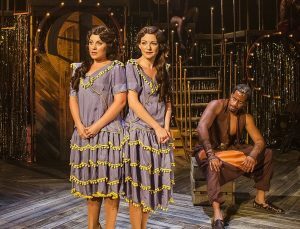 It wasn’t exactly a flop Stateside but neither did this true story of conjoined twins Violet and Daisy Hilton set the theatrical world on fire. And I fear it will struggle to find success in Britain. It should be a sure fire cert. 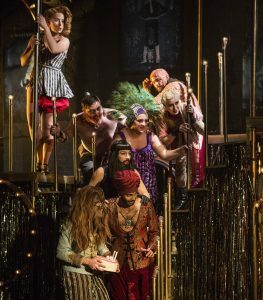 The story has all the hallmarks of a blockbuster, takis’ jaunty set captures the magic of the carny, and the performance from its principals is outstanding. 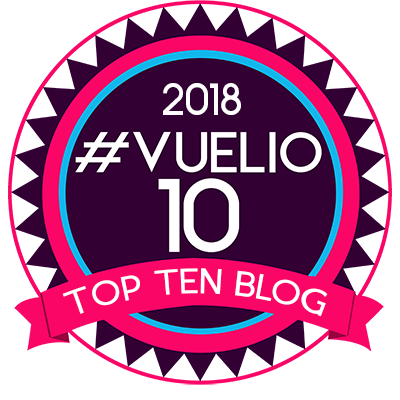 But it just didn’t do it for me – and I’m baffled as to why I walked out of the Southwark Playhouse not feeling moved or stirred by the musical. Days later I’m still trying to explain my ambivalence to it. Ultimately, after much deliberating, I’ve come to the conclusion that my disappointment must be the responsibility of Bill Russell – who wrote the book and lyrics – with some small input from Henry Krieger (music) and Bill Condon (additional dialogue). 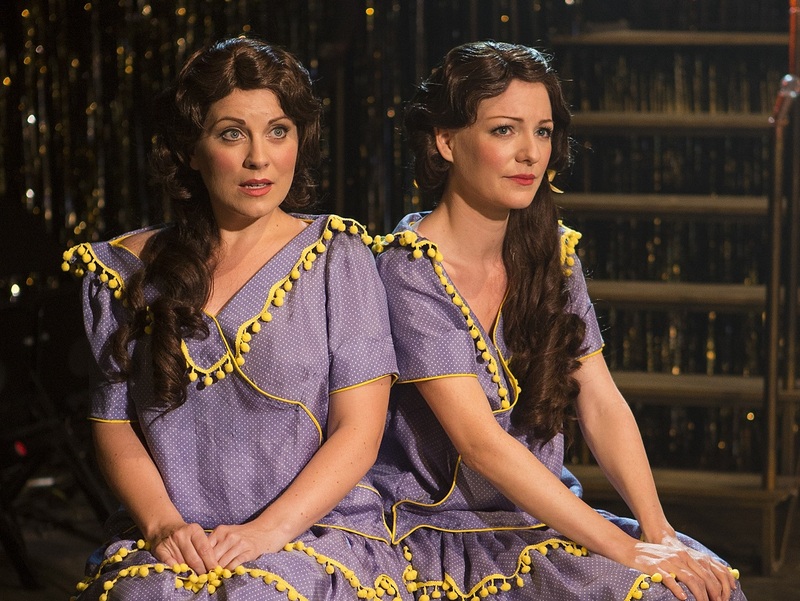 There are a couple of standout songs, performed by West End singing superstars Louise Dearman (Wicked, Evita) and Laura Pitt-Pulford, as the twins, which literally make the hairs on the back of your neck stand up, but, overall, there are just too many songs and not enough quality storytelling. Can a musical have too many? Yes, if they prevent the tale being told. The playlist runs to 37 tunes which leaves almost no room for dialogue or drama. Actually, on occasions, that is a good thing because the story gets horribly syrupy and sentimental. It takes an age to get going and then isn’t given enough space to breath. We get a couple of lines of dialogue and then the Hilton sisters, and/or the company, burst into song. The Hilton’s story is harrowing and unbelievable yet we know, from Joseph Merrick’s Elephant Man, that life for the disadvantaged was, historically, intolerably cruel. This is a tale, if properly told, which should tug at the heartstrings. The audience ought to be sobbing their heart out as they leave. But it just doesn’t happen. The girls were born in 1908 to an unmarried woman in Brighton. She took one look at them and handed them over to her employer, Mary Hilton, who saw them as a way to make cash. Throughout their childhood they were beaten and abused, dragged around and exhibited at fairs and side shows, and ordered to perform. For a price, voyeurs could look at the naked girls. After Mary died the sisters were bequeathed, like chattel, to her daughter and her husband, former balloon salesman, Meyer Meyers, who they had to call Sir, and the family business continued in earnest. Side Show makes its entrance as the cruel Sir announces the acts in tonight’s performance in Texas. “Come and look at the freaks!” shouts Chris Howell, superb as the sadistic and tyrannical showman, Sir. Into the theatre comes a wolf boy, a lizard man, a tattooed lady and a ferocious cannibal king from Africa. Like most carnival attractions there are a lot of smoke a mirrors -the heathen cannibal turns out to be Jake from New Jersey – but the star attraction is very real. 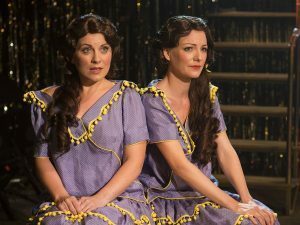 Daisy and Violet Hilton, joined at the hip and bottom (though with amazing elasticity in this production), come on to sing. In the audience is talent scout Terry (Haydn Oakley) with his friend, vocal coach, choreographer and hoofer, Buddy (Dominic Hudson). Terry is enchanted after hearing their appalling story of abuse and neglect. He promises them fame and freedom, the chance to become big stars. Cruelly his exploitation of the women sees little change in their lives other than an improvement in their frocks and venues. Worse, the men play with the girls’ emotions. The quiet, inhibited, introverted Violet (Laura Pitt-Pulford) falls head over heels in love with Buddy and the vivacious, ambitious and bolder Daisy (Dearman) for Terry. Always there to protect them is Jay Marsh, as the devoted Jake. In a telling scene he declares his love for Violet only to have it thrown back in his face because he is black. She is appalled that he would offer himself. What would people think? Marsh has a wonderfully rich singing voice that’s full of emotion. He attracts attention with “The Devil You Know” and later almost stops the show with “You Should Be Loved.” But the real powerhouse ballad is left to the girls. Their final song, “I Will Never Leave You,” is a poignant crowd-pleaser. Louise Dearman once again shows what an incredible singer and actress she is but Side Show isn’t a big enough showcase for her immeasurable talents. Laura Pitt-Pulford is a delight, as always, and the two women, who are joined at the hip for almost the entire show, work in unison with practised perfection. An entertaining but not a standout production. It isn’t helped by director Hannah Chissick failing to appreciate that two-thirds of her audience are sitting either side of the stage while her production is aimed squarely at those sitting in front. I got to see a lot of actors’ backs from where I was sitting. 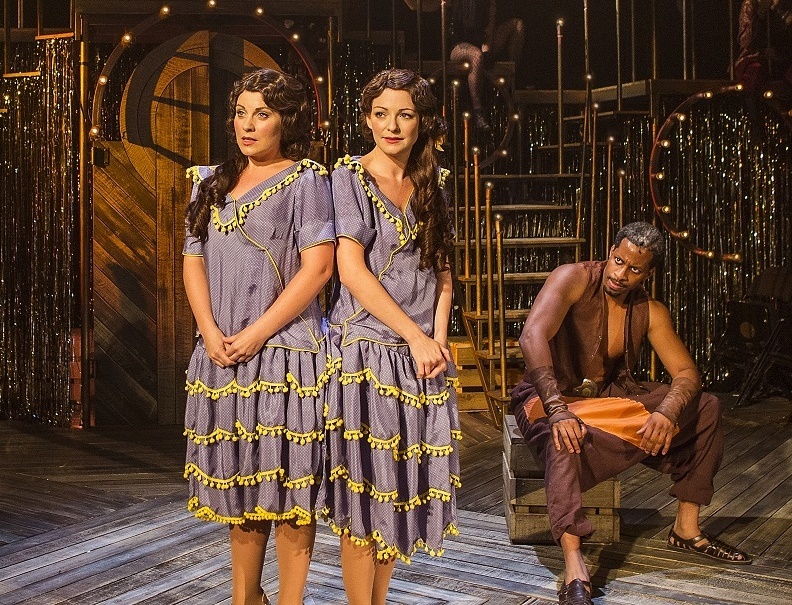 Side Show runs at Southwark Playhouse until December 3. 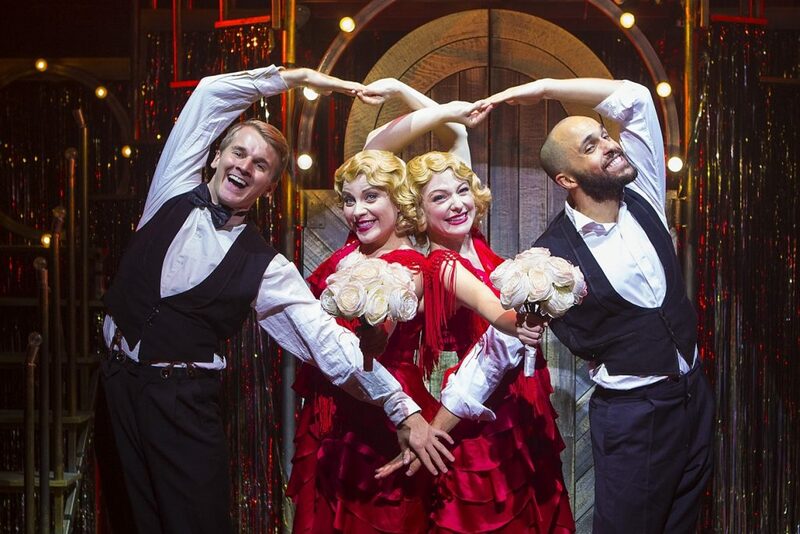 Top turns from Louise Dearman, Laura Pitt-Pulford & Jay Marsh in Side Show but they’re hampered by syrupy storytelling & an over-indulgence of tunes.